White had built his small house. Prince Karl was desperate. He had been sent to Texas by noblemen who had created a grand scheme to make a fortune by shipping thousands of farmers, craftsmen, and intellectuals to cheap land in Texas. When Prince Karl reached Galveston in July and discovered that the 9,000 acres his noblemen friends had purchased was unsuitable for settlement, he was overwhelmed by the sudden arrival of a shipload of colonists. 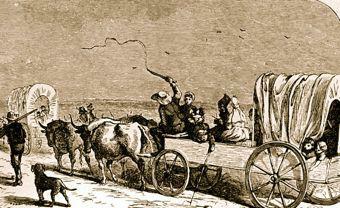 He needed a port for disembarkation and a route that offered easy passage into western Texas. White agreed to allow the German immigrants to occupy the beach near his home until the prince could make arrangements for their trek inland. either an oak or a cedar—and the children sang carols. Soon after the New Year, fifteen ox-drawn wagons and fifteen two-wheeled carts were secured and loaded for their journey into Texas as Prince Karl searched for a suitable settlement. He moved ahead of the wagon train and had the good fortune to find a tract where a short, spring-fed river (the Comal) offered excellent waterpower. The weary settlers arrived at their new home on March 21, 1845, one week after the Prince made the purchase. Despite their disappointment with the Adelsverein and the failure to secure their promised acreage, they named the site New Braunfels in honor of Prince Karl’s home. In less than a month Prince Karl abandoned the colony even before his replacement had arrived. Meantime, not all the Germans trusted Prince Karl enough to follow him on the inland search for a new settlement. Johann Schwartz (Swartz) and his family were among those who chose to stay at Indian Point. Schwartz purchased property from Samuel Addison White three miles down the bay and built a home on the site that became the center of the port city of Indianola. Neither Prince Karl’s abandonment, nor the Adelsverein’s failure to adequately fund their grand scheme slowed the shipment of more unsuspecting colonists to Texas. 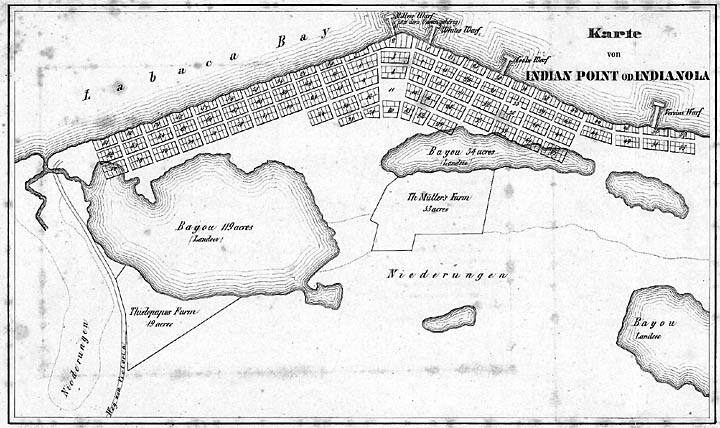 Between the fall of 1845 and the following spring, thirty-six ships brought 5,247 men, women, and children to the shore at Indian Point. There were no wagons or carts available to haul their meager supplies to New Braunfels because of Texas and U.S. politics. The impending war with Mexico over Texas’ annexation to the U.S. meant that the U.S. military troops had swept through the area confiscating all the means of transportation to haul their supplies to the Rio Grande. 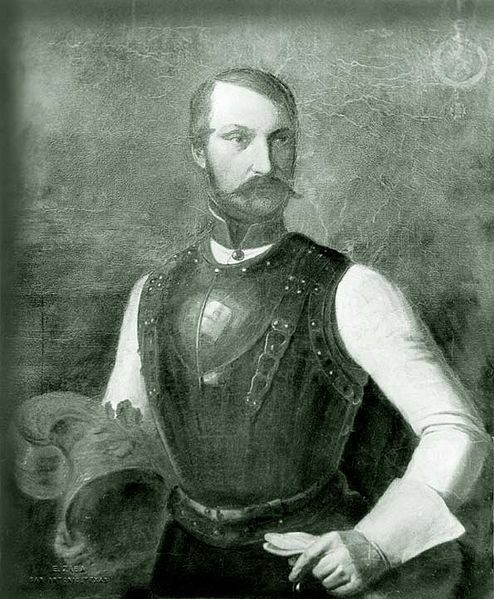 Upon hearing from the Adelsverein that more colonists were heading to Texas, Prince Karl’s replacement, Baron Johann Ottfried von Meusebach (who had the good sense to change his name to John before he reached Texas) had barracks and tents constructed along the beach for the new arrivals. As the extreme cold of that winter set in, people began dying of respiratory diseases. The tragedy served as a vehicle to create a community. Dr. Joseph Martin Reuss, who arrived on one of the ships, began his medical practice by caring for the immigrants and opened an apothecary where he prescribed free medicines. When Henry (Heinrich) Huck, a young German who had settled in New Orleans in 1844, heard about the suffering of those stranded on the Texas coast, he quickly loaded a schooner with lumber and medicine and sailed for Indian Point. Huck opened a lumberyard, helped Dr. Reuss distribute the free medicine, and gave lumber to families for constructing coffins. Henry Runge had come to the United States through Baltimore, moved to Indian Point in late 1845, and used a tent to open the area’s first bank. As the summer heat of 1846 descended on the encampment and a steady flow of new arrivals poured in, the drinking water became polluted, the sanitation facilities proved inadequate, and a plague of mosquitoes, green stinging flies, and house flies descended on the community. Frau Reuss, Frau Huck, Mrs. White, and some of the other women who had become permanent residents prepared broth for the sick and cared for children whose mothers were ill. The number of dead reached such proportions that they resorted to wrapping victims in blankets and burying them in mass graves. No one knows how many perished; the estimates ranged from 400 to over 1,200. Many people panicked and began walking to the inland colonies, spreading diseases as they moved along the route. Over 200 died along the way. Samuel Addison White platted a new town on his land in 1846 and began selling lots to many of the German families that decided to remain on the coast and begin their new life at Indian Point—a choice that would give them the prosperity and freedom they had imagined when they listened to the false promises of the Adelsverein. I think the amazing courage of those early colonists is what pushes me to keep sharing their stories. Thanks for reading. Fascinating. Wow, what hard times people had back then . . . such courage to go on, or not much choice, I guess.